My family and I were given vouchers to see a movie at Summer Drive-In. All thoughts and opinions are my own. One thing I loved doing when I was younger was going to the drive-in movies. We didn’t go that often but I have vivid memories of it. Sitting in the car with my family all cozied up and watching a movie. We don’t often get to go see any movies being the parents of 2 young children. My oldest, Pinky, is 4 and is old enough and has the attention span to go to a movie theatre but my youngest, Loo Loo, is not ready to sit still in a theatre just yet. This was another reason I was so happy to find a drive-in movie theatre near me. It’s the perfect way my whole family can go and enjoy a movie. Drive-in movies are so few and far between anymore and I was so excited to find a one right near me in the Metro Detroit area! The Summer Drive-In movie is located in Plymouth, Michigan right outside of the USA Hockey Arena. The Summer Drive-In features 3 huge screens that show first-run double-features 7 nights a week. There is also a full-service restaurant on site that will bring delicious food right out to your car on a golf cart! My family and I all packed up in our car and went to the Summer Drive-In to see Disney’s Inside Out and Jurassic World. When dusk came the movie started, my girls were in awe of being able to watch a movie outside. We had brought some chairs so we sat with the trunk of our car open with our radio tuned to the station so we could hear the movie playing. The girls loved every minute of it and I was surprised that my 2.5 year old was able to sit for nearly the entire movie. Once Inside Out ended the second movie, Jurassic World, began to play. We tucked the girls into their carseats and they slept while we watched it. It was kinda like a little date night for us without having to find a sitter! 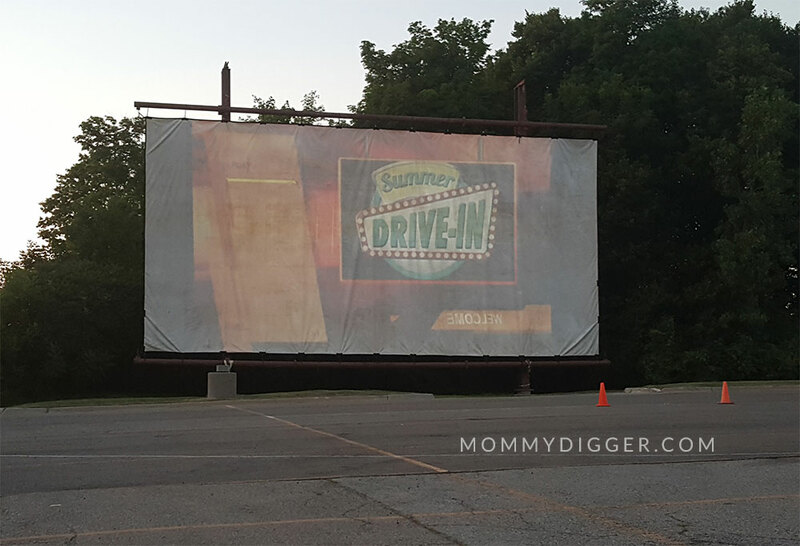 The Summer Drive-In was so much fun and I cannot wait to go back. The staff was all very nice and helpful. The movies looked great up on the big screens and it’s a great value. General admission is $10 and kids age 4-12 are $8 while 3 and under are free. Also, keep in mind for that great price you get 2 movies! They also have good specials on food. On Wednesday nights you can get a large pizza for $5! You can’t beat that! If you’re looking for the perfect summer family activity I highly recommend visiting Summer Drive-In. We’re definitely going to visit a few more times this summer! For more information and to find out what movies are playing visit SummerDrivein.com also be sure to follow Summer Drive-In on Facebook, Twitter and Instagram.